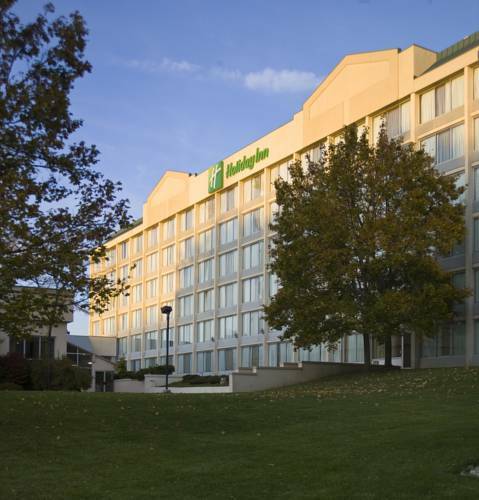 Try Our Newly Renovated Strongsville Hotel Near the Cleveland Airport The convenience of the Holiday Inn Cleveland Strongsville and its superior service makes it one of the best hotels in the Cleveland Hopkins Airport area. Situated next door to Ice Land USA, and just one mile from SouthPark Mall and local business parks, our Strongsville hotel is perfect for leisure and business travelers alike.The Holiday Inn Strongsville, a full-service hotel near the Cleveland Airport, offers business travelers a quiet, convenient location near many local and national businesses and corporate headquarters. Perks for our business guests include 13,000 square feet of meeting space, 24-hour business center, and complimentary, hotel-wide Wi-Fi.Offering complimentary shuttle service to and from the Cleveland Airport, our hotel is additionally equipped to meet all of your travel needs. Amenities include an indoor pool, fitness center, free Wi-Fi, and on-site restaurant and bar. Reserve your room today at our Strongsville hotel and experience all the comfort and style we have to offer. Simmering Pot: Selections that range from family style to gourmet cuisine. Open Monday through Friday 6 AM to 10 AM and Saturday and Sunday from 7 AM to 11 AM. Trivs: Clubby steakhouse and bar presenting prime rib, burgers and Italian inspired entrees, plus live music. Vinney's Lounge: Vinney s Lounge is open Monday thru Friday from 5pm to midnight. Saturday 1pm to midnight and Sunday 5pm to midnight. Sports fans can cheer on their favorite teams and athletes on our 200 Direct TV Sports Channels! Childrens's program - Indoor swimming pool, pool table and air hockey located in the hotel. Grand Ballroom: Grand Ballroom may be partitioned off to create smaller venus. All capacity numbers are considered maximum capacities and do not include any dance floors, buffets, projecting equipment, or staging. Contact sales office at 440.783.3015 for more details. Butternut: The Butternut Room is 300 square feet and includes a boardroom table, perfect for small meetings. Boardroom: The Boardroom is perfect for small meetings around a large boardroom table. Juniper: The Juniper room is the perfect small flexible space for meetings up to 75 people. Pine Hills Golf CoursePine Hills Golf Club offers challenging golf courses andpackages in a beautiful natural setting. OBM ArenaThe OBM Arena is Cleveland's premier ice arena and is operated by IceLand USA. The rink sits adjacent to our hotel across parking lot offer indoor skating, game room and restaurant. South Park MallThe largest mall in North East Ohio is located less than a mile from our hotel! Enjoy over 150 restaurants, shops, movie theatre, Build a Bear Workshop, indoor mini putt putt, hands on pattery painting at the Painted Penguin great for kids of all ages. Cinemark Movie Theater at Southpark Mall8 theaters with digital or 3D viewing available: Luxury Loungers recliners are electric powered, plush and oversized, and have footrests and cupholders. All seating is reserved. Reserve your seat today online or download the Cinemark app today. Go Ape Zip Line & Treetop Adventure Mill Stream RAdventure activity chain venue where groups explore the forest canopy via a treetop rope course. Scene 75 Entertainment CenterThe area's largest indoor entertainment center with 80,000 sq ft of fun 4 permanent food trucks, a full center bar, 12 indoor attractions, 120+ arcade games, indoor go karts, laser tag, arcase bounce inflatables, mini golf and much more!